Tony Hsieh is the kind of boss everyone wants. Since I first wrote about him in March 2010 I have followed his career with interest and I am a huge fan of his people-focused approach to running a business. The story of Zappos is the ultimate story of how corporate culture can drive commercial success. As an Internal Communicator, number six is obviously my favourite. Zappos believe that open, honest communication is the best foundation for any relationship. They even put it on a T shirt. They don’t need to spell out if they mean internal or external communications, because for Zappos they are one and the same. Zappos employee communications are conducted in public, in full view of their customers and fans. On 6 June 2012 Tony Hsieh sent an email to Zappos staff about a very significant corporate development. At the same time he sent a link to the email to his 2.4m followers on Twitter and posted it on http://www.zappos.com. Most companies sending this kind of all-staff email hit the send button and sit back, hold their breath and wait for a disgruntled employee to leak it to the press. Not Zappos. It’s an interesting email. Not just because it demonstrates Zappos fusion of internal and external communications. It also contains some lovely pointers towards a corporate culture that has become legendary in employee engagement circles and shows that none of the lustre has been lost by the constraints of plc ownership since Amazon paid $1.1bn for the company in 2009. I love the fact that Zappos don’t call their Executive Management Team “EMT”, “SMT”, or “ExCo”. No, Zappos call it FACT, after Fred ‘no title’ Mossler , Arun Rajan (CTO), Chris Nielsen (COO & CFO), and Tony Hsieh (CEO – he’s the one with “Zappos” tattooed on his head). Despite being CEO of the world’s largest online shoe retailer, I don’t believe Tony Hsieh sees himself as a shoe seller. I think he sees his job as the architect and curator of a unique company culture. A culture where employee empowerment and happiness creates a very powerful virtuous circle where happy staff equals happy customers and happy customers equals even happier staff. And on it goes, leaving investors, shareholders, founders and owners very happy bunnies. Tony Hsieh is the kind of boss everyone wants. Tony Hsieh is also the kind of boss every shareholder wants. Delivering Happiness officially hit the streets today – although it kind of feels like it has been out there and read by millions of us already. It deserves to be a major success if for no other reason than the extraordinary way in which it has been marketed over the last few months. It will be a best seller because never before has an author put so much heart and soul into launching a book. I suspect it cost a few bob as well, but how much better to spend your marketing budget on delighting a legion of existing fans and admirers and leveraging their already enthusiastic advocacy, which has already resulted in 40 reviews on Amazon, 32 hits on Google News just today, and attracted pieces in the Wall Street Journal, New York Times, and CBS News. So what is all the fuss about? Read the book and certainly in the early stages you encounter a pretty ordinary guy. If anything, an under achiever. A flighty, fidgety sort who seemed to lack focus and drive. As a teenager and young adult, he was far from being a model student and a worthy employee. To put it bluntly, his low boredom threshold and inventive ways to avoid doing work did little to point to the fact that he would become a multi-millionaire by his early twenties. That should be pretty inspirational stuff for thousands of listless teenagers out there who think life is sooooooo unfair. Like many successful entrepreneurs, Tony Hsieh was far more interested in finding ways to make money than to focus solely on his studies. He was making $200 a week from a mail order business making buttons at High School. And while his parents thought he was diligently practicing his violin for an hour every day, he was reading ‘Boy’s Life’ magazine behind his bedroom door whilst the rest of the house listened to a pre-recorded loop of him scratching away at the fiddle. At Harvard he did as little academic work as possible, spending a lot more of his study time in bed than I ever did at Uni, and instead of working nights for one week every term at the local bakery to like I did to make ends meet, Hsieh was making considerably more from his late night fast food operation selling burgers and pizzas to his peers. Somehow he graduated with a degree and got a very well paid job with Oracle. That did not last long as he found it tedious and unchallenging. His subsequent stint as a self employed web designer went much the same way. All the time, Hseih was learning the importance of doing something you were excited by. So much so that a few years later when he sold his Link Exchange to Microsoft for a mere $265m, with a personal fortune of $41m, Hseih gave $8m back because he didn’t have the patience to wear his golden handcuffs for another few months. He had worked out that for him, following his passion was more rewarding that chasing the buck. And then came Zappos. Having read the book I can see that Tony Hseih’s passion had very little to do with selling shoes. Online or offline. No – his passion is for driving human (and therefore corporate) performance through amazing customer service. It could have been furniture, whoopee cushions, griddle pans or fishing tackle. It just happened to be shoes. Aided by the inspiration of some people he met along the way. What drives this man is the pursuit of happiness and the recognition (or is it faith?) that there is a proper commercial virtuous circle, where happy staff equals happy customers, equals happy shareholders. Most companies focus their efforts on creating shareholder value. Tony Hsieh knows that very few people get out of bed in the morning to create shareholder value. A few companies flip this convention on its head and works their butts off the make their staff feel valued, empowered, trusted, respected and dare I say loved. This rubs off on customers big time. And so it’s pretty good for profits too. If any of this resonates, you should read Delivering Happiness: A Path to Profits, Passion and Purpose. If you think it sounds like a load of old tosh, you should read Delivering Happiness: A Path to Profits, Passion and Purpose. It’s a 10 minute presentation by Dan Pink, author of the much acclaimed Drive: The Surprising Truth About What Motivates Us, which contains some really interesting insights drawing on four decades of scientific research on human motivation. Most experts agree that money is never at the top of the list of factors which motivate people. Dan Pink agrees with this with one notable exception; higher pay equals better performance provided the job being performed involves only mechanical/repetitive tasks. Where work calls for anything beyond this, such as rudimentary cognitive skills, creativity and decision making, larger rewards can actually lead to poorer performance. Personally I think there is a very simple sociological issue exposed here which does not get discussed. People who perform jobs that are very mechanical and repetitive tend to be less well paid. Poorly paid people will respond to financial incentives. It’s blindingly simple. They need the money. People who routinely need to exercise their cognitive skills, creativity and make big decisions are by default paid much higher salaries. When you are paid a lot, financial incentives are far less compelling. They don’t need the money quite so much. He does not exclude money completely as a work place motivator. If you don’t pay enough, people won’t be motivated. Pink’s fundamental premise is that provided you pay enough, and thereby take the issue of money off the table, then autonomy, mastery and purpose become the three main forces for motivation and engagement. I guess this is not inconsistent with Maslow’s Hierarchy of Needs, which most psychologists and sociologists seem to swear by. The content of the video is very interesting in its own right, but what makes it a truly great find is the very clever and ever so engaging use of animation as an alternative to death by PowerPoint. I think they call it scribing, and a British company called Cognitive Media appear to be pioneering this stuff. Honestly, it really works. Judging by the number of ‘likes’ and positive comments on the Yammer thread, people really enjoyed the experience. I found the technique quite riveting. Give it a bash; it is 10 minutes well invested if, like me, you are turned on by interesting new ways to communicate. I was delighted to see Atlassian get a mention as well. Atlassian are right up there with Netflix and Zappos when it comes to promoting the importance of a strong company culture as a differentiator and source of genuine commercial advantage. In this context, Atlassian are held up as an example of the importance of autonomy at work. Google famously do the same with their 20% time and Yahoo call them Hack Days. I like! 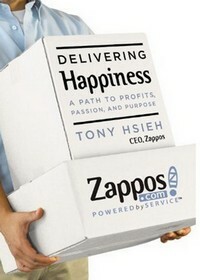 Next week sees the much anticipated publication of Tony Hsieh’s Delivering Happiness. I was fortunate enough to get my hands on a couple of advance copies a few weeks ago on the understanding that I would review the book on Riding the Ripple and give the other copy away to one of my readers. It’s a bit like being gifted tickets to Super Bowl on the understanding that I turn up for the game. Why would I not want to write about one of the people on planet earth that I most admire? As books go, I’ve read better. But as a real life example of how a very different kind of corporate culture can become the driver of unprecedented commercial success, it really doesn’t get better than this. Tony Hsieh is no literary genius; he is just a straight forward, straight talking chap who possesses bucket loads of intellect, emotional intelligence, drive and humility. Oh and he happens to be CEO of one of the last decade’s biggest internet sensations, Zappos. On the face of it, Delivering Happiness is an archetypal story of rags to riches – and as a self confessed Sunday Times ‘How I made it’ addict for donkey’s years, I’ve read hundreds like it. But actually I haven’t. I have never read anything quite like this before, because Tony Hsieh is a one-off. How many people do you know who would turn their back on trousering $8m in order to chase a passion? How many CEOs do you know who’s core beliefs on human interaction are heavily influenced by the very tribal behaviour experienced in rave culture? How many companies do you know that prefer to create interesting stories through delivering amazing customer experience instead of paying for PR? How many companies do you know that rely on word of mouth and spend the money that other companies would spend on advertising on customer service? How many companies do you know that communicate with their customers and staff at the same time, over the same channels? I will be examining these and other themes in the book over the next few weeks. For now I hope I have whetted your appetite for Delivering Happiness sufficiently that you’d like to take a shot at winning yourself a free copy. All you have to do is RT any tweet you see from me mentioning Delivering Happiness and then DM me and tell me how many posts on Riding the Ripple mention Zappos, and how Tony Hsieh pronounces his surname – is it Shay, Sigh or Shy? Alternatively you can just buy it on Amazon! My infatuation with Zappos reached new heights at the weekend. Nailed on to undermine morale, there is nothing worse than working in an environment where the grapevine consistently beats formal and informal communication channels, especially when things go wrong and there is no acknowledgement. Too many companies operate in a climate of unnecessary secrecy, either in the belief that you can keep a lid on major foul ups (which you can’t) or because they have yet to learn the art of corporate apology. This applies equally to the internal and external audience by the way. Internally, without acknowledgement there is no learning and the most powerful thing about making a mistake is the shared learning opportunity it presents. Honesty and openness when a clanger is dropped should contribute to that particular clanger not being dropped again. Ignore it – or God forbid try to cover it up and you will be punished. Maybe not immediately, but your time will come. I’m very blessed to be working for a company that gets this, and whilst it may not quite be up there with Zappos, it’s not far off. So, back to the incident/communication that prompted this outpouring of love and goodwill. How does this rate for speed, transparency and humility in the face of a customer pricing mistake that cost the company a $1.6m loss in the space of 6 hours last Friday? It’s beautiful is it not? It’s a great day at Zappos how may I help you? Wow – just did a keyword search on Zappos and realised I haven’t blogged about them yet. How can I possibly expect to be taken seriously as a communications professional if I haven’t even mentioned them before? Let’s put the record straight. I love Zappos. I love Tony Hsieh. I love their new website. I love their core values. I love their weirdness. I love the fact that Amazon paid $900m for an online shoe shop. I’d probably love to work there if I was not so utterly in love with Betfair. Zappos core value number 6 is a thing of beauty: Build Open and Honest Relationships With Communication. Zappos believe that open, honest communication is the best foundation for any relationship. They don’t need to spell out if they mean internal or external communications. For Zappos they are the same thing. Zappos internal communications are conducted in public, in the full view of their customers and their fans. They acknowledge that communication is always one of the weakest spots in any organization, no matter how good the communication is. That’s why I guess they are so driven towards communicating with their customers and their people so openly and honestly. Because it creates trust and trust is the basis of any relationship, especially an online commercial one. So if anyone was going to create a TV ad campaign based around real customer and staff interactions, it was going to be Zappos. I really like the results. What a great way to expose your company’s personality! If you are interested in Zappos, you can follow Tony Hsieh on Twitter – alongside 1.6m other doting fans. I can’t think of many other CEOs who can command such a following. Actually I can’t think of any – can you?